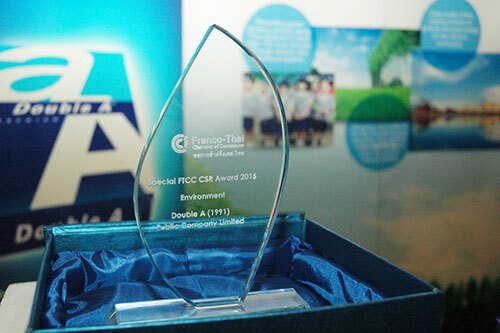 Bangkok, Thailand, 31 October 2015 - the Franco-Thai Chamber of Commerce (FTCC) has recently conferred Double A with a Special Environmental Award for developing a unique and sustainable source of fiber, Paper from KHAN-NA, implementing a sustainability policy in Thailand in accordance with international standards, and setting goals and achieving results adapted to Thailand’s culture and specific context. The awards presentation was held during the FTCC Annual Charity Gala Dinner on 20 October 2015. FTCC CSR Awards aims to reward companies that are committed to putting sustainability into action. The award was inaugurated this year in light of the upcoming Annual Conference of Parties on Climate Change (COP21) which will take place in Paris during 7-8 December 2015. Double A and four other winning companies will be featured in a tuk tuk ride at the COP21. The FTCC Charity Gala Dinner was graced by His Excellency Mr. Gilles Garachon, the French Ambassador to Thailand and Dr. Suvit Maesincee, Thailand’s Deputy of Commerce Minister.